Somewhere opens with a shot of a black Ferrari aimlessly driving around in circles in an open area. This goes on for a few minutes, after which popular actor Johnny Marco (Stephen Dorff) steps out and gazes into the horizon. End scene. This minimalistic shot sets the stage for the rest of the movie, one that most either seem to love or hate, with very few settling somewhere in between. Johnny Marco is an apathetic actor who shows little emotion to what surrounds his life. Twin strippers, hotel parties, movie press conferences — he seems disillusioned by it all. As he inches through his life, his 11-year-old daughter Cleo (Elle Fanning) is left to live with him for an undetermined amount of time by his ex-wife. This brings a sense of change to Johnny’s life, and now he has no choice but to begin to show some signs of responsibility. Not a lot happens in Somewhere. The movie focuses on Johnny’s life outside of the movies and it shows the strain of his relationship with his daughter, but there are no major events that take place. We are merely taken in on a period of this movie star’s life, one who is marred with some sort of depression. 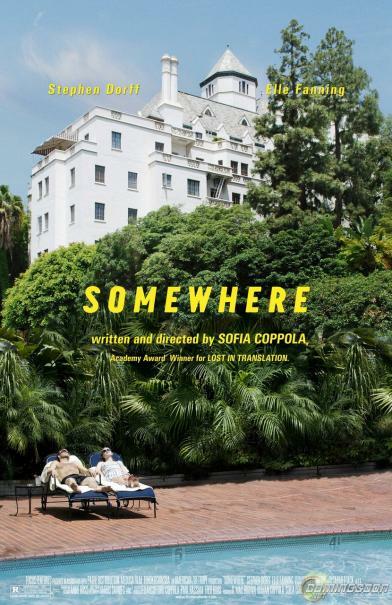 Director Sofia Coppola lets the film crawl along, often invoking the use of extended scenes, many of which will leave some people scratching their heads in bewilderment. Occasional quirks are brought up but never resolved. I found these traits to be enjoyable and oftentimes humorous, but it’s easy to see how they could bother certain audiences. The best moments in Somewhere happen when both Johnny and Cleo are on screen together. Their relationship is simplistic, but there is noticeable chemistry between the two. This is helped by strong performances from the two leads. Stephen Dorff is effective at showing minimal emotion, and Elle Fanning’s acting feels natural and authentic. Since the movie is strictly about these two characters, there aren’t many noteworthy roles played by others. A seemingly random selection of Chris Pontius (of Jackass fame) plays Johnny’s friend and roommate, Michelle Monaghan plays an actress that he has worked with before, and Ellie Kemper (The Office) briefly escorts Johnny around in Italy. While Somewhere’s slow pace sometimes works against itself, I found the movie to be a very interesting character study overall. It requires a fair amount of patience and the right mindset, but if you are willing to stick with it you should be able to get something out of it. While not up to the level of Lost In Translation, Somewhere is still an involving experience that can be utterly compelling at times.